CPR, Inc. (Care Packages for the Region) is a growing 501(c) (3) nonprofit organization serving communities in Lake County Indiana and the Chicagoland area. We began our mission to help local folks just a year ago. It is hard for me to believe this all started as a tiny family project. I hoped to help individuals without homes get a fresh start with some basic supplies. This was not a novel idea, yet it provided a simple way to lend a hand, and a teachable moment for my children. I never anticipated that we would grow into a thriving community organization. I am amazed by the love, kindness and generosity so many have shown as we reach out to those in need. Each new project is a humbling adventure. This blog is intended to provide news and information about our current goals, past successes and upcoming events, as well as to give thanks to all those who fuel our mission. Everyone is welcome to get involved. Donations, volunteers and ideas make each project a success. Veteran’s Day is upon us! CPR is currently serving NWI Veterans Village in Gary, Indiana in an ongoing project to provide food for Football Sundays. These 44 veterans have battled homelessness and found new hope with this wonderful organization. 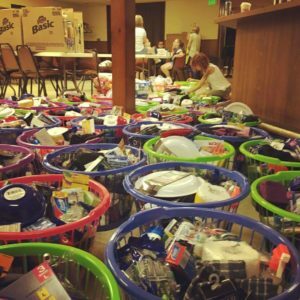 We were honored to create care packages in the form of laundry baskets filled with personal and household necessities for these men and women who served in our United States military. Thanks to many private donations, a sponsorship grant from the Legacy Foundation and the generous support of the Northwest Indiana Veterans’ Action Council, CPR has been able to continue our service to these veterans by delivering delicious, quality food each Sunday. Welch’s Stop & Shop, Strack & Van Til, Gelsosomo’s Pizza, La Quesadilla, Lelulo’s and many Region families have pitched in to provide these meals so far. The veterans have loved every bite, and we appreciate our community generosity immensely. However, we are not done yet. Football season has only just begun. If you or your business would like to be a part of this special project, please contact me for details. We are in need of future meals, snacks, desserts and other supplies that make each Football Sunday a fabulous feast for these veterans. Our meal this week is good old-fashioned home cooking, courtesy of the Kilarski and Appiah Families. Thanksgiving time is upon us. The Teddy Bear Preschool is collecting care package supplies for us AGAIN. They filled a whole room of our house last year. We love you! The Southlake YMCA Indian Maidens continue to support us with their service work. The Hopi Tribe November Service Project will be making Christmas Crafts and Desserts for the veterans at NWI Veterans Village. They are also collecting care package supplies as part of their 2017 Holiday Drive. The Kikiwaka Tribe is dedicating their December Nation Event Service Project to CPR. The girls are making fleece blankets and each tribe member is donating hats, scarves and gloves which will be distributed to the homeless.Thank you Indian Maidens! What would we do without you? CPR is SO grateful to have a new web designer/developer, Heather Bricker! She has volunteered her professional talent and time to us. I am thrilled to have her on our team. This is wonderful! I love the blog. Yay!